A few days ago I ventured into the Centro Storico (historic center) of Naples to check out the Christmas decorations and festivities taking place. The city was buzzing with tourists and locals alike, as the day of the Immaculate Conception is a national holiday in Italy. Pushing my way through the crowds, I strolled down Via San Gregorio Armeno, knows as the "street of Nativity workshops," or “Christmas Alley.” The streets are lined with one workshop after another, where visitors can actually see the nativity scenes and figures being constructed. Over half a million tourists visit these shops every year, and I had picked one of the busiest days to visit. After admiring the gorgeous handmade nativity scenes (Naples is known for their artisanal production of nativity scenes or “presepi”), I worked up an appetite. 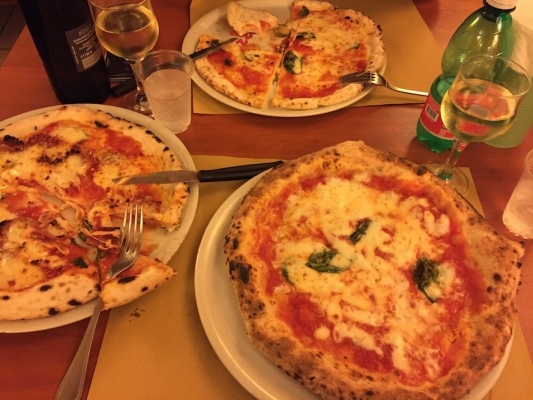 Since I was already in the Centro Storico, a neighborhood I don’t normally frequent, I decided to try what I was told is one of the best pizzerias in Naples. Everyone has their own opinion as to which pizziola makes the best pizza, but I had heard about Sorbillo from several natives as well as visitors. Walking up to the pizzeria’s storefront, I found a throng of diners forming a large crowd around the door. Like I said, I had picked one of the busiest days of the year to visit the historic center. After pushing my way up to the host, I was told the wait was an hour and a half. Luckily I knew that just down the street, there was another Sorbillo location that served the same time honored recipe. Here the wait was only an hour, or so I was told. After taking a stroll to the nearby Piazza del Gesu, I returned to find the same crowd. The next few minutes seemed to crawl by, a half hour turned into an hour, an hour into two, and just when I was about to give up, my name was called. Only two hours and twenty minutes after I had arrived. talking, but this was the best pizza I ever had in Italy. The crust had the perfect mix of crispy wood fired edges, soft interior and super thin base. The sauce was deliciously sweet, the basil fresh and herbal, and the cheese something dreams are made of. A note for those who are gluten intolerant and still love pizza: Sorbillo serves gluten free pizza, and it’s actually good. My fellow diner has celiac disease, and I can attest that his gluten free pizza crust was just as soft as mine. So it’s confirmed, Sorbillo serves some of the best pizza in the country; and I’m not the only fan. In addition to the hoards of pizza enthusiastswho endure the long line daily, posted outside the original Sorbillo location are photos of its famous visitors. New York Mayor Bill de Blasio, celebrity chefs, and Pope Francis himself are among the pizzeria’s distinguished diners. Indeed for some of us, pizza is sacred.